"One neither desires coffee nor a coffeehouse. One desires to talk with others, coffee is but an excuse." From the days of the Ottoman Empire through to the present, coffee has played an important role in Turkish lifestyle and culture. The serving and drinking of coffee has had a profound effect on betrothal and gender customs, political and social interaction, prayer, and hospitality traditions throughout the centuries. Although many of the coffee rituals are not prevalent in today's society, coffee has remained an integral part of Turkish culture. First brought to Istanbul in 1555 by two Syrian traders, coffee became known as the "milk of chess players and thinkers." By the mid-17th century, Turkish coffee became part of elaborate ceremonies involving the Ottoman court. Coffee makers with the help of over forty assistants, ceremoniously prepared and served coffee for the sultan. Marriage customs and gender roles also became defined through coffee rituals. In ancient times, women received intensive training in the harem on the proper technique of preparing Turkish coffee. Prospective husbands would judge a woman's merits based on the taste of her coffee. Even today, when a young man's family calls to ask a girl's parents for her hand in marriage, a formal coffee is served even in the most modern households. For both men and women, coffee has been at the center of political and social interaction. During the Ottoman period, women socialized with each other over coffee and sweets. Men socialized in coffee houses to discuss politics and to play backgammon. In the early 16th century, these coffee houses played host to a new form of satirical political and social criticism called "shadow theatre" in which puppets were the main characters. Over the years, Turkish coffee houses have become social institutions providing a place to meet and talk. Today, Turkish coffee houses continue their role in society as a meeting place for both the cultured citizen and the inquisitive traveler. Istanbul offers many new and delightful cafe-restaurants where friends and family meet to discuss topics of the day over a cup of traditional Turkish coffee. 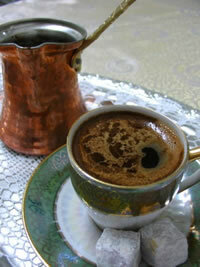 Derived from the Arabica bean, Turkish coffee is a very fine, powder-like grind. An aromatic spice called cardamom is sometimes added to the coffee while it is being ground. One can also boil whole seeds with the coffee and let them float to the top when served. Turkish coffee has various levels of sweetness ranging from bitter to very sweet. Because sugar is not added to the coffee after it is served, spoons are not needed. As the coffee begins to heat, it begins to foam. A rule of the Turkish coffee ceremony dictates that if the foam is absent from the surface of the coffee, the host loses face. Turkish coffee is served hot from a special coffee pot called a cezve. Tradition states that after the guest has consumed the coffee and the cup is turned upside down on the saucer and allowed to cool, the hostess then performs a fortune reading from the coffee grounds remaining in the cup. Rich in tradition and flavour, Turkish coffee remains a favourite today, not only in Turkey, but also among discriminating coffee drinkers around the world.